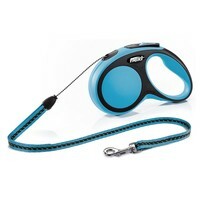 Flexi Comfort Retractable 8m Cord Lead (Medium). Designed in the style of the Flexi Classic, the Comfort lead has a comfortable, ergonomically designed handle and also features a range of unique user-friendly features and accessories. The handle of the Comfort Medium lead can also be adjusted using a simple turn screw to customise it comfortably for any size hand. The sophisticated lightweight lead also features a comfortable short-stroke braking button as part of the built-in quick response braking system, ensuring the highest standard of safety and comfort on your daily walks. The lead has been designed to extend up to a distance of 8m (26ft), allowing your dog more freedom, whilst allowing you full control and the ability to retract your pet as needed. Suitable for dogs weighing up to 20kg.